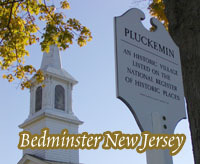 The Township of Bedminster, with 8,402 residents and 27.6 square miles, is characterized by many desirable qualities. With a diversity of landscapes, parklands, residences and services, Bedminster offers an agreeable quality of life most communities cannot claim. From Pottersville to Pluckemin, from Union Grove to Burnt Mills and from Lamington to Bedminster Village, our town presents a pleasant mix of history, natural beauty, access to amenities and excellent schools. We're also fortunate to have a well-managed municipal government and low taxes. Bernards Township offers a wonderful quality of life that includes small town friendliness; a sense of place and community; and a rich history. There are a number of very tangible assets here, such as good schools and neighborhoods; a quaint downtown; historic hamlets, beautiful natural areas with trees, green spaces and open farmlands. A borough with roots in the Revolutionary War era, Bernardsville has managed to maintain its smalltown charm in the face of modern-day development pressures. Bernardsville was originally a section of Bernards Township know as Vealtown. In 1840, Vealtown became Bernardsville, named after Sir Francis Bernard, Colonial governor of New Jersey from 1758 to 1760. Nestled in the northern most part of Somerset County, just 12 miles south of Morristown, New Jersey, this rustic community sits in some of the last vestiges of the Great Eastern Forest. The railroad line was built through Bernardsville in 1872 and played an important role in the borough’s development. Bernardsville did not become a separate borough until 1924, when it split from Bernards Township. Bound Brook is a borough in Somerset County, in the New York metro area. Bound Brook is on the Raritan River Troops led by British Gen. George Cornwallis defeated American forces here in 1777. The thirty-three square mile area which is now the Township of Bridgewater was originally purchased from a local Indian tribe. Chartered by King George II of England in 1749, and incorporated in 1899, Bridgewater is a modern suburban municipality with a balance of residential and commercial uses. In the early years, Bridgewater was known as a farming town. What is now Somerville and Raritan were once part of Bridgewater Township until they broke away years after the chartering. Today, as was said, Bridgewater is a diverse and thriving township with a mix of both rural and suburban life.Township is prime ground for many new and large businesses, including Sanofi-Aventis, J&J, MetLife, and Phillips-Van Heusen. Bridgewater has progressed rapidly from its rural roots, and will continue to grow in the future. Far Hills center was originally a religious center with a farm and small church built in 1758. Until recently Far Hills was a quiet villiage consisting mainly of farms and a few residential neighborhoods. In 1882 a railway station was constructed for easy access to New York City. This allowed city dwellers to relocate to the picturesque area and commute to Manhattan. The history of Franklin Township and the Raritan Valley was largely influenced by the Dutch settlers who came around 1650. They settled in this area by trading and bargaining for landPainting - Raritan Indians with the Raritan Indians. No document exists to prove conclusively whether the Township was named for William Franklin, Governor of New Jersey from 1762 to 1776, or Benjamin Franklin. In 2000, the Township Council determined that it was desirable to official espouse a theory as to the naming of the Township. After considering the evidence set forth in Franklin Township, Somerset County, NJ: A History, William B. Brahm, Commissioned by the Franklin Township Library, 1998, Chapter 12, Municipal Government, The Case for William Franklin and The Case for Benjamin Franklin, the Township Council determined to espouse the theory that the Township was named for Benjamin Franklin. Hillsborough and the surrounding area were first explored by the Dutch in the middle 17th century. At that time the area was occupied by the Unami Indians who were a part of the Lenapi Tribe. Because they spoke the Algonquin language they were considered part of the Algonquin Nation. Records of the Proprietors and Reeds map of 1685 show that large tracts of land were patented to shareholders in the Proprietorship at a very early date. Some of the earliest land transactions found in the records of Hillsborough begin around 1700 and include the names John Royce, Peter DuMont and Hendrik Beekman. Some of this land lies along what is now South Branch River Road. A short time later farms were carved out of a tract patented to Thomas Barker, whose land was along the Millstone River. Once known as Somerset Courthouse, Millstone Borough was home to the county seat in 1738 and remained so until the courthouse and jail were destroyed by British raiders. It is the smallest municipality in Somerset County and possesses the distinction of a National Historic Site. Established in 1702 by Dutch and English Settlers, Montgomery Township (population 22,741 - 2005 census estimate) continues to combine a unique convenience of location with the lifestyle features sought by residents and businesses. Located in the southern portion of Somerset County – six miles from Princeton University and roughly half way between New York City and Philadelphia – the Township is an historic 32 square mile community with an agricultural heritage. The small town with the odd name. Peapack and Gladstone, located at the northern end of Somerset County in the famed Somerset Hills, is a combination of two villages into one borough. Peapack is the southern village with a tiny shopping district, train station, post office and small cottages clustered around Main Street. Gladstone is the northern village with a tiny shopping district, train station, post office and larger Victorians clustered around Main Street. Two train stations? Two post offices? YES! Raritan Town was originally carved out as a subdivision within Bridgewater Township by act of the New Jersey Legislature in 1868. After a series of bitter lawsuits between Raritan and Bridgewater in the 1930s and 1940s, the Legislature allowed Raritan to become an independent Borough in 1948. 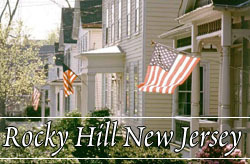 Rocky Hill, New Jersey is a very old village. Located as its name suggests on a stone ledge, it was part of the lands belonging to the Unami, or "people down the river," tribe of the Lenni Lenape Indians. In 1701, John Harrison was employed by the Governor and the Proprietors of East Jersey to take over title of all Indian lands in the province. In a deed obtained from Nowenock, the Indian chief, dated June 24, 1717, he is called "John Harrison of Rockie Hill." He owned many areas of land, and started the first grist mills on the Millstone River. He served as a member of the Assembly from Somerset County, 1703 and 1707. The Borough of Somerville plays an important role as the center for professional services in the area. It is the county seat of Somerset County and is the site of Somerset Medical Center, a major regional medical center for Somerset County. There are a number of law, professional and medical offices are located in the Borough of Somerville. The Borough of Somerville enjoys a mix of commercial, professional and residential development while also enjoying the ambiance of a small town with a main street setting unique in the region. South Branch is an unincorporated community within Hillsborough Township, located in Somerset County, New Jersey. The community goes back to 1750 and was also known as Branchville. It is situated on the South Branch Raritan River near its junction with the Raritan River. The Narticong Tribe of the Lenni Lenape Native Americans lived there and called it "Tucca-Ramma Hocking." It was here that the Dutch who made their way up the Raritan to bargain for land made their deal in exchange for beads, guns, blankets, powder and jugs of rum. 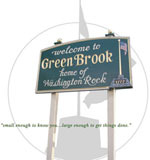 Called by one early author "the greenest place in New Jersey," Warren Township stretches from the crest of the First Watchung Mountain across Washington Valley to the Second Mountain and beyond, ending at the Dead and Passaic Rivers. Now encompassing an area of 19.3 square miles, Warren was half again as large before 1872, the year the communities now known as North Plainfield, Green Brook and Watchung were carved from its land mass. The Watchung Mountains, whose natural beauty characterizes the township, came into being 125 million years ago when volcanic eruptions to the west covered the area with two thick lava flows that later were tilted upwards 20 degrees. Then, gradually, imperceptibly, during the millions of years that followed this massive shifting of the earth, water eroded away the land, exposing the jutting edges of the buried lava. These exposed basaltic edges, now much weathered, are the First and Second Mountains; between them lies a broad, fertile valley through which flows the Middle Brook. The Borough of Watchung was organized on April 20, 1926 and covers an area of approximately 6.2 Square miles. Watchung was settled in the early eighteenth century and grew slowly until recent years. In 1960 the population was 3,312 and in 2000 it was 5,613.